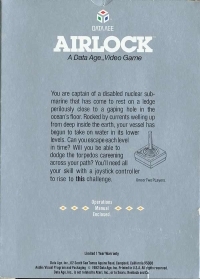 Box Text: You are captain of a disabled nuclear submarine that has come to rest on a ledge perilously close to a gaping hole in the ocean's floor. Rocked by currents welling up from deep inside the earth, your vessel has begun to take on water in its lower levels. Can you escape each level in time? Will you be able to dodge the torpedoes careening across your path? You'll need all your skill with a joystick controller to rise to this challenge. 01-31-2012 pacpix Box Text You are captain of a disabled nuclear submarine that has come to rest on a ledge perilously close to a gaping hole in the ocean's floor. Rocked by currents welling up from deep inside the earth, your vessel has begun to take on water in its lower levels. Can you escape each level in time? Will you be able to dodge the torpedoes careening across your path? You'll need all your skill with a joystick controller to rise to this challenge. 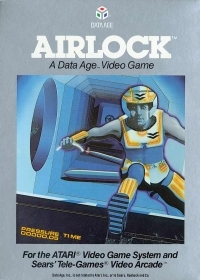 This is a list of VGCollect users who have Airlock in their Collection. 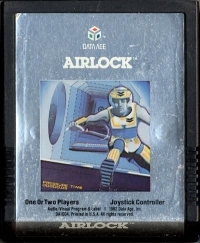 This is a list of VGCollect users who have Airlock in their Sell List. This is a list of VGCollect users who have Airlock in their Wish List.